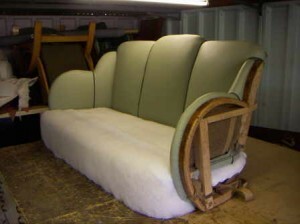 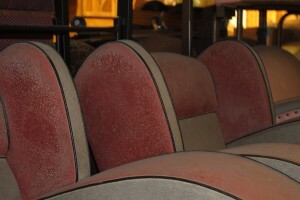 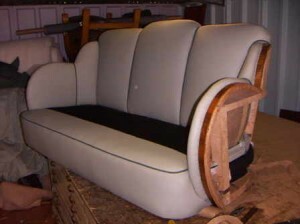 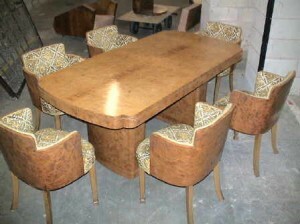 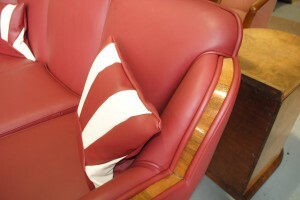 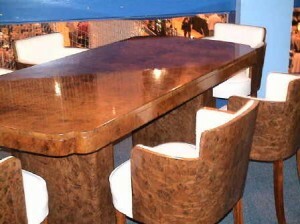 Our trade at Cloud Nine Art Deco is re-upholstery and re-polishing. 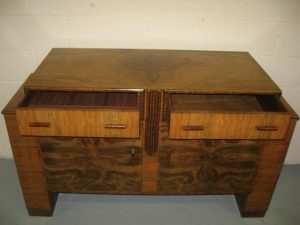 We have 40 years of experience and we specialise in the re-upholstery of Art Deco furniture to your personal specifications and re polish amazing pieces back to their former glory, using nothing other than traditional methods and materials. 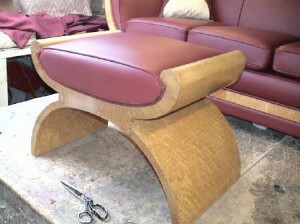 Why not let us create something special for you! 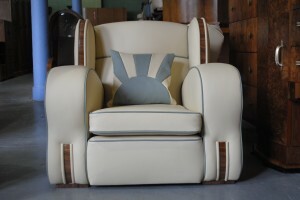 Select your Art Deco suite or piece of furniture from our stock and have it upholstered in the material and colour of your choice and repolished, all beautifully and professionally done in our own workshops; a service we believe to be unique. 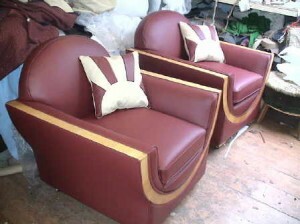 Typical examples of what can be achieved. 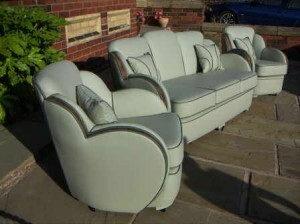 POA does not mean expensive, It just means that there are varying prices dependant on the customers requirements. 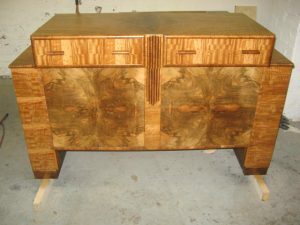 For instance, a Sideboard is optional and of course the customer may prefer to have the Chairs reupholstered in fabric as opposed to Leather. 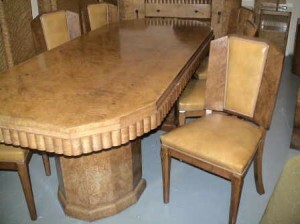 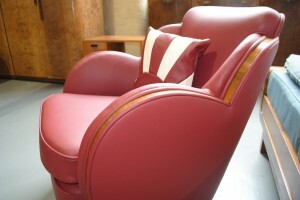 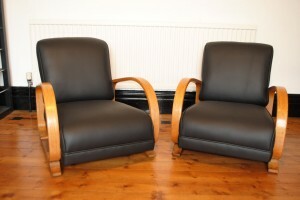 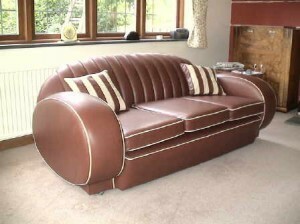 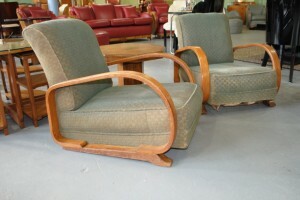 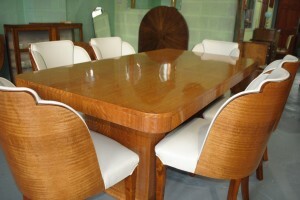 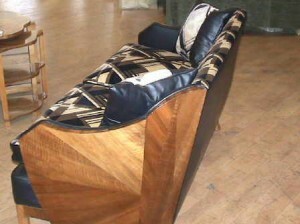 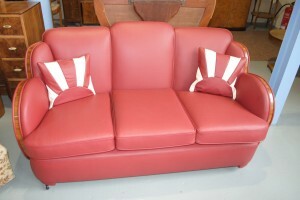 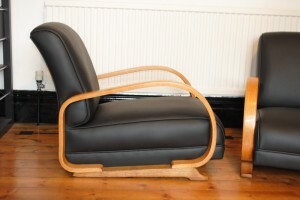 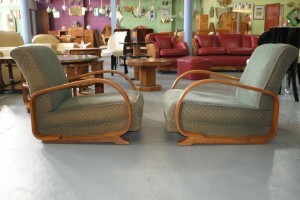 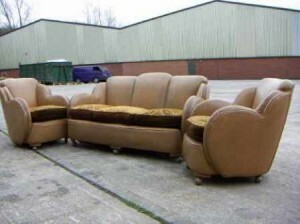 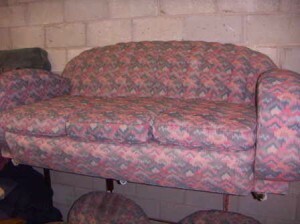 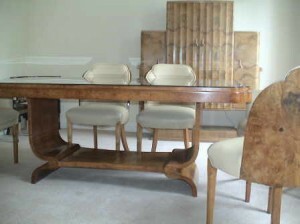 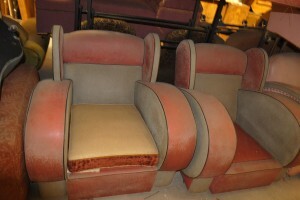 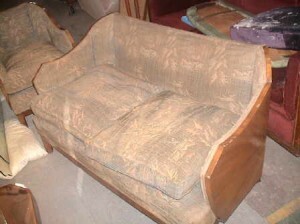 The same service is also available for the many other items of Art Deco soft furniture. 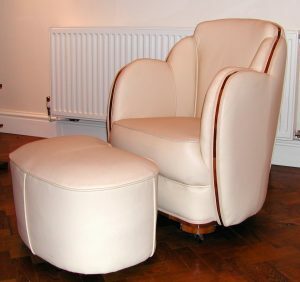 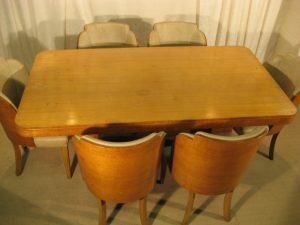 If you already own your ideal Art Deco three piece suite or Dining suite but the years are beginning to take its toll, a visit to our upholstery and repolishing/restoration workshop is a must! 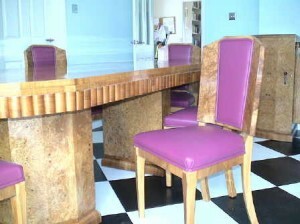 We are able to acquire some amazing Art Deco geometric Moquette fabric in all colours. 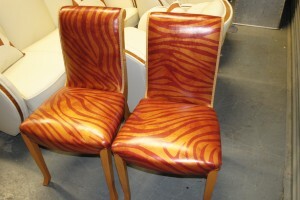 These must be seen to be believed. 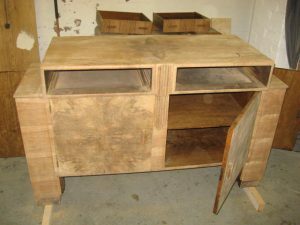 Before, this sideboard looking tired! 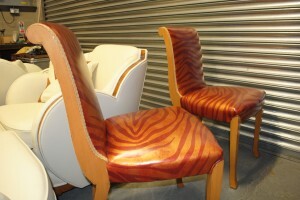 During the process of re polishing, stripped completely in our workshop! 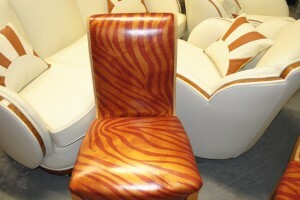 After, totally re finished using traditional methods to look vibrant and alive again! 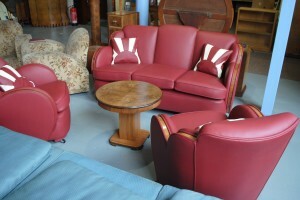 We have the Archive section, which shows a selection of our past work. 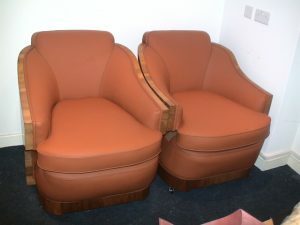 This is where you get to see photos of three piece suites, armchairs that we have reupholstered to customers specification and furniture that we have repolished. 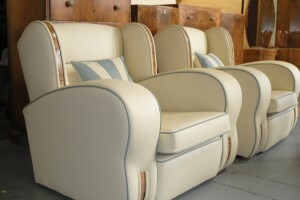 To give you an idea of what can be achieved with all of our Art Deco seating stock and furniture, please click to view. 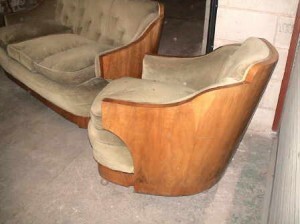 Also here are a few!